The North Park Theatre’s much-heralded restoration has already added to Hertel Avenue’s vibrancy. Today, there’s more excitement as the Goo Goo Dolls are scheduled to perform there and record footage from the sold-out show for a future DVD. The band’s performance at the local landmark promises to be a date to remember for North Buffalo, said neighborhood residents and business owners. “I think it’s awesome that they’re coming here. The revival of the North Park is probably the best thing that’s ever happened to Hertel, and I’m happy the Goo Goo Dolls support the city they come from,” said Nura Ramadan, a waitress at Bertha’s Diner, located next door. “It’ll bring a lot of attention to Hertel Avenue. 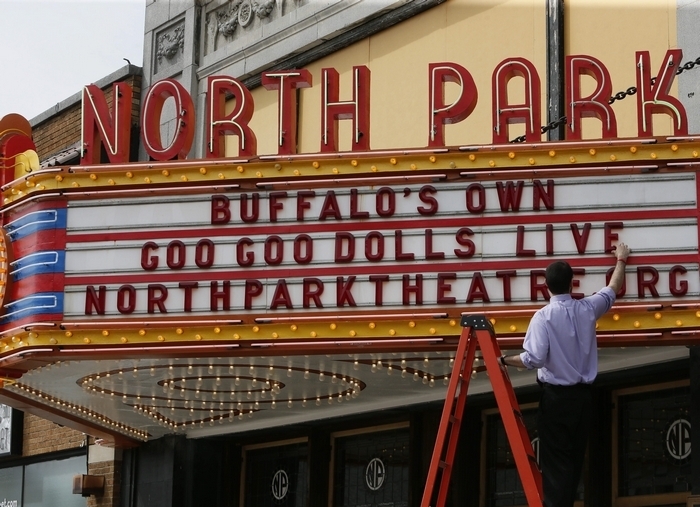 The Goo Goo Dolls are supporters of Buffalo, and it’s a pretty big deal,” said Rick Goetz, manager at Bob & John’s La Hacienda. Owners Thomas J. Eoannou and Michael Christiano reopened the North Park Theatre last month, restoring its marquee and uncovering the artwork and architectural details that had been hidden by dirt and grime or covered over for decades. Among the improvements are new carpeting, refurbished lobby and bathrooms, some improved seating and a freshly painted screen to project images from a new digital projection system. Buffalo police will be on hand if the crowd gets too big, especially people showing up without tickets. Band member Robby Takac said he looks forward to seeing the restored theater. He remembered watching movies there during its leaner days. Takac said he and John Rzeznik used to frequent North Buffalo, mentioning Bob & John’s, Taste of Thai and Lombardo’s among favored restaurants. “I think there’s a new life that’s come to the Hertel area right now,” Takac said on the phone from the Meyer Theatre in Green Bay, Wis., prior to the band’s Sunday performance. Judy Porto, treasurer of the Hertel-North Buffalo Business Association, called the theater’s restoration the latest big development in the commercial district’s momentum. “We are happy to see new restaurants and stores come onto Hertel Avenue. In the past few years, Hertel has started to come back and see more people enjoying what North Buffalo has to offer,” Porto said. Co-owner Christiano said the movie theater is not looking to present concerts, but made an exception for a local band, and because a portion of the proceeds will go toward the theater’s ongoing restoration. “The theater for 40 years has shown independent movies. It’s a winning strategy, and we think it’s the best thing for the community. We can periodically do fundraisers such as this, but our driving force is getting the best movies into the North Park,” Christiano said. So far, tickets sales suggest the approach is working. “The people have responded to the theater and the movies in an incredibly positive way, and we just want to keep progressing and moving forward,” he said. Rich Bernecki, a driver at Bob & John’s, was among those who didn’t think the Goos at the North Park was a big deal. “It’s a good thing for the North Park Theatre, but I’m not super-excited that they’re coming. It would have been a bigger deal 10 years ago than now, when they were bigger,” Bernecki said. Nick Daigle, La Taviola Trattoria’s sous chef, offered a more upbeat outlook. “I think it’s a big deal, and will be great for the community while drawing attention to the theater. It will draw a different crowd, and be good for local businesses,” Daigle said.